One of the leading causes of death in the modern time is cardiac arrest. It is sudden, shocking, and often unforeseen through symptoms. It can happen with people of any age. Most of the people cannot differentiate between a heart attack and a cardiac arrest. A heart attack happens when oxygen-filled blood flow through the arteries to a section of heart stops due to blockage, which causes certain heart muscles to start dying. The heart beating does not always stop during a heart attack. On the other hand, Cardiac arrests are sudden and show no symptom before occurring. The normal rhythm of blood pumping suddenly gets hampered with irregular heartbeats and the heart is unable to pump sufficient blood to the lungs, brain and other organs. As a result, a person loses consciousness and pulse within moments and can die within a few minutes if not treated immediately. In either of the cases, one important thing is to call paramedics and professional medical services for emergency response, but by the time they get to the victim, First Aid has to be given. This has to be performed by the person nearest to the victim. If there are two people nearby, one has to call for professional help while the other person starts CPR. CPR has to be continued until medical help arrives or AED is found. This can be potentially lifesaving because this simple yet efficient device is capable of doing wonders. Let’s see how. AED is short for Automatic External Defibrillator. It is a lightweight, external and portable device that delivers an electric shock to the heart through the chest. This shock can apparently fix a cardiac arrest by reviving the regular heart rhythm of blood pumping. The few minutes after a cardiac arrest are the most precious time of the person. AED literally works as the lifesaver at those moments. Nowadays, AEDs are kept in hospitals, workplaces and other convenient spots for helping in any emergency case. Some people even carry it with them for ‘just in case’ scenarios. When a person suffers from either cardiac arrest of heart attack, he/she needs to be given immediate help. While the emergency medical support arrives, First Aid has to be given. At first, CPR is given until help arrives. It is best if there is an AED at the reach of hands. If there are two persons, one can keep performing CPR while the other person arranges AED. It is mentionable that trained people should perform CPR as a priority. AEDs can be used by non-medical people as there are instructions labelled onto the device. Most AEDs have a voice instruction installed as well. After placing the AED on victim’s chest, it records the rhythm of heart pumping and detects the irregularity. When a shock needs to be given, it prompts the user to press a button and when the button is pressed, the shock is delivered. 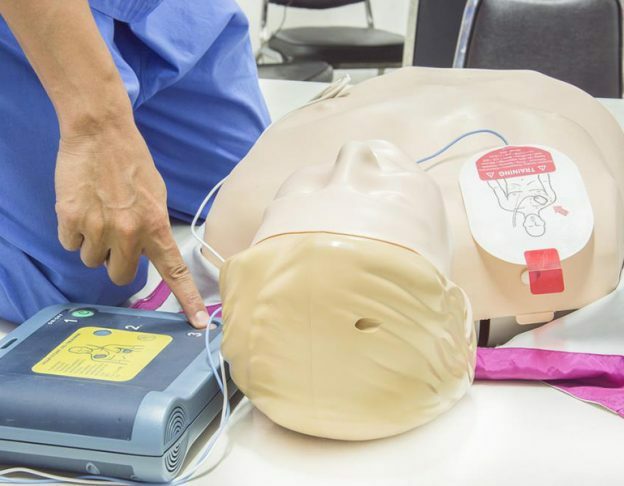 Most of the times AED is successful and that’s why it has become a necessity for saving people’s lives who suffer from cardiac arrest or heart attack. It is highly recommended to keep AEDs in the reach of hands to tackle any emergency situation. Especially at home and in workplaces. For those of you who didn’t know about AED, CPR and difference between Heart Attack and Cardiac Arrest, inform as many people as you can as it is a piece of information which can save a person’s life. The best option is to get training in first-aid and CPR and learn about the matters hands on. Gold Coast based Accredited Training Company is a training institute which provides these services and don’t forget to contact them if you’re interested. ← Why not make it a group booking?